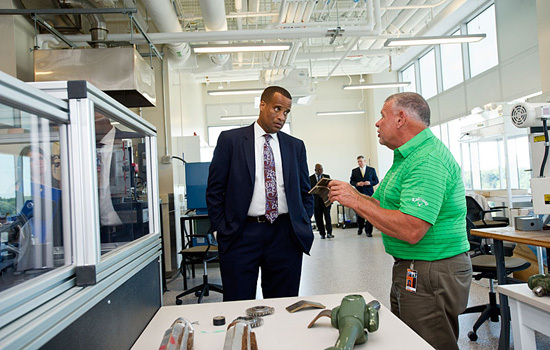 U.S. Assistant Secretary of Commerce Jay Williams listens as Michael Haselkorn, a senior staff engineer at Golisano Institute for Sustainability, explains material evaluation and product design in manufacturing parts. Williams toured RIT on July 24 to review federal investments made to RIT for economic development projects ranging from the Center for Urban Entrepreneurship to the Food Cluster Initiative hosted at Golisano Institute for Sustainability. It’s no secret that universities have become economic development engines, turning knowledge and research into commercialized products and services. Federal economic development leaders are looking to further tap into the “knowledge economy.” And in Washington, D.C., RIT is no secret. U.S. Assistant Secretary of Commerce Jay Williams toured RIT July 24 and visited the Golisano Institute for Sustainability, the Simone Center for Student Innovation and Entrepreneurship, the MAGIC Center and the Center for Urban Entrepreneurship at its downtown location. Willie Taylor, regional director of the Department of Commerce’s Economic Development Administration, joined Williams. At the Center for Urban Entrepreneurship, the federal government is investing $1.5 million toward construction and renovation costs. The award from the U.S. Economic Development Administration will help refurbish an iconic Rochester landmark, the former Rochester Savings Bank building at 40 Franklin St., which was donated to RIT in 2012. Renovations continue at the historic four-story, 47,000-square-foot building in the heart of downtown. On campus, Williams and Taylor were given an update on the RIT-led Finger Lakes Food Processing Cluster Initiative. The program is an effort to help the region prosper by providing innovative assistance programs, training and collaborative partnerships to the food-processing cluster. They also learned of new ideas and ventures at the Simone and MAGIC centers. The federal leaders were also in town to discuss the Rochester-Finger Lakes region’s recent designation as a manufacturing community by the U.S. Department of Commerce under the “Investing in Manufacturing Communities Partnership” program. The designation offers selected communities preferential consideration for up to $1.3 billion in federal dollars.